William Lowe is the owner of WilLowe Consulting, LLC and is a proud Citizen of the Muscogee (Creek) Nation. William attended the Muscogee (Creek) Nation Boarding School and graduated from Eufaula High School in Oklahoma. After high school William served his Country as an Infantryman in the United States Marine Corps for nine years. Once his military service was complete, he attended and graduated from Bacone College where he majored in Business Administration. William began his professional career at the Cherokee Heritage Center in Tahlequah, OK serving as a membership coordinator. It was there that he found his passion for Native American Non-profit Fundraising and Tourism serving as the Development/ Tourism & Marketing Director. William is credentialed as a Certified Fundraising Manager and a Certified Tourism Industry Specialist through Indiana University-Perdue University Indianapolis. After honing in his skills as a business leader, William served as the Executive Director of the Grand Lake Association in Grove, OK. William is the owner of WilLowe Consulting, LLC and assists Tribal Nations across the Country in Economic Development, Cultural Tourism, Fundraising and Event/Meeting Planning. 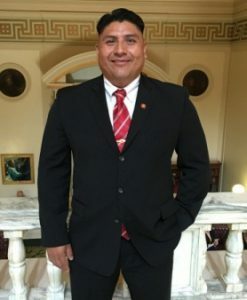 William is a member of the American Indian Alaskan Native Tourism Association, Association of Fundraising Professionals, Green Country Marketing Association, American Legion Post 135, The Marine Corps Association and is a Bedouin Shriner. He formerly served on the Board of Directors for the American Indian Alaskan Native Tourism Association, Green Country Marketing Association, Lake Eufaula Association, Okmulgee Main Street Association and is currently serving on the American Indian Chamber of Commerce State Board of Directors. William is also a 2011 recipient of the Native American 40 Under 40 Award given by the National Center for American Indian Enterprise Development.